Each month The Menagerie brings even more colour and vibrancy to The Fringe Bar on Allen Street and aspires to celebrate the diversity and originality within Wellington performing arts. 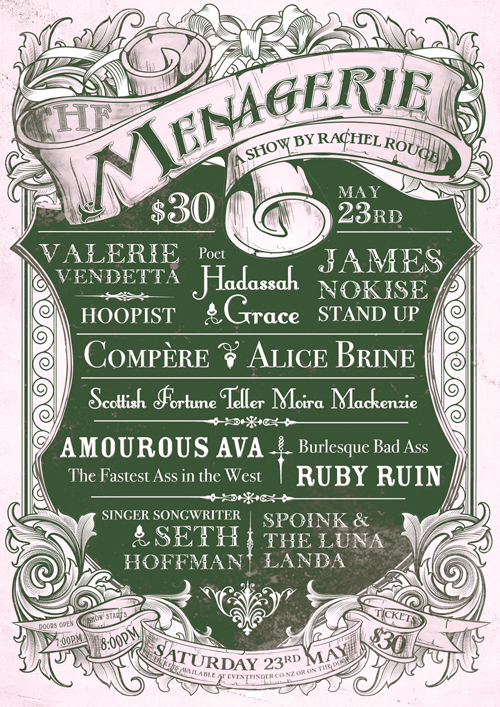 The Menagerie is curated by Rachel Rouge, a Wellington based veteran burlesque performer who fell in love with variety shows on the Edinburgh Fringe cabaret circuit. Each performer in The Menagerie is selected by Rouge who seeks to take the audience through a journey of exquisite and varied entertainment in every show. This month Rouge has another strong line up featuring two local comedians with very different styles: Alice Brine and James Nokise As well as two out of town burlesque performers: classic performer Ruby Ruin from Christchurch and comedic character performer Amourous Ava from Auckland. They will be performing along side a hoola hoopist, a fortunte teller, a poet, a drag artist and musicians. Rouge works to create a Victorian carnival sideshow feel to the event, she is inspired by the turn of the century travelling sideshows. Show is at 8pm at The Fringe bar, Wellington, Saturday the 23rd of May.